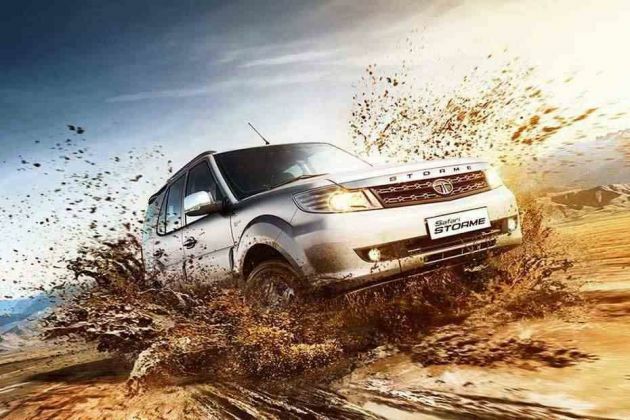 Tata Safari Storme VX Varicor 400 is a new trim introduced in this model series. The company has preserved the overall design of the exterior and the interior, while minor changes have met the engine and the gearbox. Firstly, the engine's power and torque have been upgraded, while the gearbox has been changed to a 6 speed gearbox. Everything apart from this have been kept the same. Coming to the outside, the chrome highlights by the front facade release a more alluring aura upon the vehicle. Slender body lines also add to the overall design dynamics, while the alloy wheels make for a plush character. The interior of the machine has been graced with elements of style and comfort. The two tone color scheme makes for a more energetic aura, and this is further enhanced with the presence of an illuminated glove box, puddle lamps and many other convenience aspects. For the entertainment requirements of the passengers, there is an integrated CONNECTNEXT music system by Harman, and the controls have been incorporated into the steering wheel for the benefit of a cleaner, more hassle free drive. The car has a husky and enormous build that gives it a more prominent aura. This has been further tuned for a more progressive and modern feel, with refined design themes such as stylish wheels, expensive appliques and many more. Starting with the front, there is a sleek grille that comes with the Tata emblem mounted over it. The bonnet gets a clean chrome finish, with the STORME letters embossed in black. The headlamp clusters on either sides come with intricate detailing. At the bottom, the slender air dam adds value to the car's appealing posture of the front. Clear lens fog lamps are present at the front that further contributes for a strong visibility when driving. By the side, the massive fenders add to the aggressive template of the vehicle, and this is further enhanced by the prominent body lines below the windows. Chrome plating on the outside mirrors makes for a more affluent design tone for the vehicle. The B pillar gets a unique styling tape, and there are elegant scruff plates on all the doors. The 16 inch alloy wheels are impressive as well, and they accentuate the trendy character of the vehicle. Side cladding enhances the layout of the side, making for a touch of sportiness. The exhaust pipes at the rear also wear a splendid chrome finish, and this is improved by the chrome tailgate finisher that comes along with the TATA embossing. The cabin is large, spacious, and it has been furnished with a variety of appealing design themes. Going along with this are host of comfort oriented features, both of which together ensure that the passengers enjoy a pleasant and stress free drive. The seats are built on precise ergonomics, and black colored fabric clothing has been robed over them for a more enriched drive feel. The center console has been applied with a warm silver finish. For this variant, there is a color scheme that has overlapped fabric black with black, making for a more opulent and enjoyable drive atmosphere. A warm silver finish has been treated to the deco as well. Aside from giving a vibrant look, the car also presents a variety of comfort features for the benefit of the occupants. Stowage areas are present above the center stack, together with armrests for the front passengers, auxiliary sockets for charging devices, along with a master light switch. The vehicle gets an upgrade for the engine specifications. It is powered by the same 2.2-litre four cylinder diesel engine. Now, as a result of improvements, it can belt out a power of 154bhp at 4000rpm, combined with a torque of 400Nm at 1750rpm to 2500rpm. Another significant milestone for this new edition, is the new 6 speed manual gearbox, which works to bring hassle free shifting and improved performance. There are ventilated discs ascribed to the front wheels, while normal drum brakes with an auto adjuster govern the rear. Coming to the chassis area, the front axle has been rigged with a double wishbone type suspension with the presence of coil springs and shock absorbers for the best handling quality. The rear axle is subdued to a coil spring type 5 link rigid axle suspension. The rack and pinion type steering comes along with hydraulic power assistance, further bolstering the control quality when driving. Power steering helps to augment comfort as well as safety for the driver. Next, there is also an adjustable steering column for boosting this function. Heating, ventilation and air conditioning is together provided in one system, giving the most comfortable and pleasant atmosphere for the benefit of the occupants. The air power windows come along with an express power down feature, relieving strains for the occupants. The electrically adjustable outside mirrors come along with turn indicators, together with heating and folding functions. The electrically operated remote fuel flap is also an article of convenience for the passengers. The remote central locking system comes along with a flip key. Aside from all of this, the driver's seat comes with height adjustment feature, and 3 way lumbar support is supplied for both front occupants. The second row comes with a 40:60 split arrangement, allowing passengers to store larger luggage at the rear when required. The front occupants are secured owing to the presence of dual airbags. Anti lock braking system prevents skidding or wheel locking, and this is further enhanced by the electronic brake force distribution. The car's design includes crumple zones and side impact beams, enabling the strongest protection in case of a mishap. The rear view mirror comes with an anti glare function for the operating benefit of the driver. In addition to this, there is a door opener warning, a key out warning for headlamps on and a motorized headlamp adjuster. 1. The engine power has been enhanced. 2. Presence of ABS/EBD is a strong factor. 1. The outer appearance could be improved. 2. Lack of a more sophisticated music system files as a drawback.